Refocussing, as the name suggests, is about focus and refocus. The theory and practice was first developed by Diane Divett in 1995. Sharkey, J. & Clarke, D. (2011). Refocussing: A God based counselling method. Calvert, S; Sharkey, J. & Clarke, D. (2011). 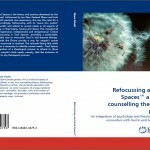 : Clients’ Perceptions of Spiritual Experiences in Refocussing Therapy. As an author, pastor, teacher, educator, counsellor, Dr Divett recognised the need for Refocussing to have a variety of different applications. Refocussing for trauma (see Rwanda). With Diane’s pastoral and teaching background she was well placed to begin teaching and training others in what she had developed. Accordingly, by 1997 she had provided extrensive teaching materials and manuals including a counsellors training curriculum which she trialled with the Vineyard churches in NZ. She documented early on in her writings, how Refocussing has various levels of effective application: the individual level, the pastoral care/counselling level, the highly skilled and therapeutic and as an amazing tool for evangelism, introducing people to God. At the time the material was also formed into a set of teaching videos (now in dvd format), for training Refocussing therapists. However, still not satisfied with the level of research she had conducted, Diane then went on to provide further and more extensive research at post graduate doctoral level at the University of Auckland, beginning in 1999. At the same time she was conducting her doctoral research, others also researched Refocussing at post graduate level. They each completed Masters and post- graduate diplomas using Refocussing as their main research topics. A central reason Dr Divett felt ‘called’ to research and provide a sound academic theory for Christians that integrated theology and psychology is that she believed that while most theories in psychology did attempt to help people resolve their unmet, unfulfilled or maladjusted needs they simply did not go far enough. For example, while psychology may help people to focus on ‘needs’, using various theoretical and practical methods, what she suggests as being necessary to facilitate true wholeness is a way to refocus on the objective Other, namely God, as our fundamental resource. Shift to a new space of understanding, insight and empowerment. From this space decisions about vision, purpose, dreams, future and healthy ‘wholistic’ living can be made. “The plans I have for you says the Lord are plans of good and not of evil, of a future and a hope“.